The following article about the JoyBringers appeared in the Hazleton (PA) Standard-Speaker newspaper on Sunday, March 15. Katie Fridman and Jodi Reichart, of the Mountain Grove Lutheran Parish in Bloomsburg, make figures and hats out of balloons for St. Luke Manor resident Geraldine Harris. Wearing a shy smile, Emily Kresge fiddles with the blue parrot in front of her trying to make it stand. But Polly is uncooperative. So the St. Luke Manor resident lays the balloon bird on its side to watch Pastor Craig Lantz twist and shape a kelly-green shamrock. Lantz, of the Mountain Grove Lutheran Parish in Bloomsburg, came to the nursing home Saturday afternoon with his church's youth group, "JoyBringers." Comprised of 14 teens and four adults, Joy Bringers takes trips to local nursing homes and other facilities. They make balloon animals, while chatting and spending time with others. The Joy Bringers, said Kresge, live up to their name. "They were great - extremely polite. I enjoy the kids," she said. Seated with Kresge, residents Susan Wilcox and Mary Fetchko both received yellow balloon poodles from the youth group members. "They were lovely," said Wilcox. Nodding in agreement, Fetchko added that the group's visit was the highlight of her weekend. "We waited for this," she said of the Joy Bringers' visit. Their trip to St. Luke Manor in Hazleton was the first outing for the youth group. Each of the members had to master the art of balloon sculpture before coming, Lantz said. The pastor showed off his own balloon prowess by wearing a 1-foot-high shamrock hat on an orange, white and green base. Making balloon-shaped animals or flowers for people is a lot of fun, he said, but it is only part of the JoyBringers' mission. "The point is for the kids to bring joy to people by visiting them and brightening their day," he said. Some of the residents, he said, don't receive a lot of visitors and particularly enjoy stops from outside groups. Lantz said his goal is to make regular trips to area nursing homes. "In the past our youth groups have visited nursing homes but only on Christmas and Easter. But a lot of groups visit at those times. We wanted to do something they could enjoy all year round," he said. Having the teens visit St. Luke was enjoyable for the senior citizens, Marie Vendel, activities assistant. said. "It means the world to the residents. They love kids and intergenerational activities," she said. Vendel said the Joy Bringers are welcome to return again soon. "I really appreciate their coming," said resident George Stevens, while watching 13-year-old Brian Tretter of Bloomsburg and Michael Brown, 10, of Mountain Grove form balloon hearts and dogs. "I haven't been feeling well and they are very cheery," he said. 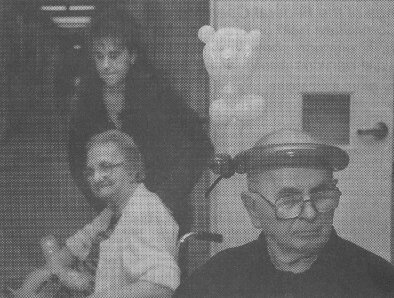 Michael Chulock, 78, of Hazleton wears a bear balloon hat that was made for him by members fo the JoyBringers youth ministry. In the background, activities assistant Marie Vendel wheels resident Alice Beishline. Read the great article Aid Association for Lutherans wrote about us in the July/August issue of their national magazine, the Correspondent ! Katy Fridman was nervous standing outside the nursing home resident's room. This was the first time Katy, along with the JoyBringers youth group from Mountain Grove Lutheran Parish in Bloomsberg, Pennsylvania, had visited the facility, and she didn't know how people would react. She brought her best friend to calm her fears, but it wasn't working. Finally, Katy and her friend entered the room and went to work. 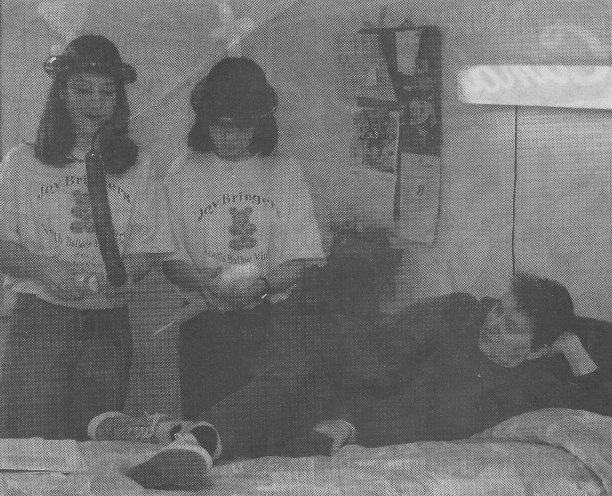 "I remember that the woman couldn't talk but as I started making an animal with the balloons, the woman smiled," recalls 14-year-old Katy. That smile eased Katy's fear, and the two teens stayed for an hour. Katy's story is one of many successes for JoyBringers Youth Balloon Ministry, started in 1997 by the Rev. Craig Lantz, an AAL member. Lantz, who until February was youth minister at Mountain Grove Lutheran Parish, which consists of three churches, heard about balloon ministry while attending a convention two years ago. "One of the balloon companies was giving out samples, so I started making animals," Lantz says. "Then this idea came to me of combining balloons, kids and nursing home residents." Lantz brought together 22 youths, ages 10 to 18, from the parish churches--Trinity Lutheran in Mountain Grove, St. Peter in Beaver Township and Emanuel in Mainville. Lantz shared balloon-twisting techniques and taught the children how to start conversations, deal with difficult people and communicate with people who can't speak. JoyBringers is an ongoing ministry, and Lantz requires all youth to commit to at least three trips. "So far, everyone who was available has been on all our trips," he says. "We take 15 to 16 kids to a facility, depending on the number of residents." From the moment they enter a facility, youth are encouraged to approach residents. "Either they strike up a conversation, or they use the balloons as a way to make that connection," Lantz said. The whole point is to bring some brightness into these people's lives. Most nursing home residents are craving some kind of interaction. The balloons are the gimmick." JoyBringers is the first youth ministry program Lantz has found successful. "I've done caroling and I've taken groups to visit nursing homes, but there wasn't a lot of interaction. Balloons provide the catalyst to bring generations together," he says. Josh Fridman, Katy's 12-year-old brother, says JoyBringers works. "You get to make balloon animals and cheer up the seniors," Josh says. But participants in JoyBringers learn more than the art of balloon-making. "Ever since I've been going, I have more respect for the elderly," Katy says. "Nursing homes aren't really scary places." In fact, Katy has visited the nursing home on her own. "I take my clarinet and play," she says. "I always thought seniors were cranky," Josh says. "I've learned that's not true." These are lessons Lantz hopes to bring to his new youth ministry at Zion Lutheran Church in Glen Rock, Pennsylvania. "We've had kids say they hate nursing homes, yet they still want to go because they can see the impact they're having," Lantz says. "The biggest lesson these teens learn is that some of the most difficult things in life turn out to be the most rewarding." Stephen Wuerger works at AAL's home office and can be reached by e-mail at steve_wuerger@aal.org. The Rev. Craig Lantz credits AAL's Youth Serve program for making JoyBringers a reality. Youth Serve encourages Lutheran youth to help others through volunteerism. Youth Serve grants are provided based on the number of young people participating in a volunteer service project. Through the AAL branches associated with Mountain Grove Lutheran Parish, Lantz was able to use Youth Serve grants to pay the ministry's start-up costs, which included purchasing balloons, air pumps and instructional booklets. "This wouldn't have been possible without Youth Serve," says Lantz, who is starting his second JoyBringers group at Zion Lutheran Church in Glen Rock, Pennsylvania. For more information about Youth Serve, talk to your branch leader or call (800) 236-3736, ext. 5909. For more information about JoyBringers Ministry, contact the Rev. Craig Lantz by mail at Zion Lutheran Church, 49 Hanover St., Glen Rock, PA 17327; phone at (717) 235-3276 or e-mail at clantz@joybringers.org. A balloon ministry manual also is available for $10 through Lantz.